Theresa May has held meetings with leading Tory Remainers, amid speculation about further defections. Justine Greening and Phillip Lee say Mrs May has ignored requests from pro-EU Tory MPs in favour of Brexiteers. The pair had separate meetings with the PM in Downing Street. In a separate development, an ex-Labour Independent Group MP says they would help to keep Mrs May in power if she agreed to another EU referendum with Remain on the ballot paper. However, the PM was focused on her own party on Thursday, as she met cabinet ministers David Gauke and Greg Clark. The pair have warned of the dangers to business of leaving the EU without a formal deal, an option which Brexiteers in the European Research Group of Conservative MPs insist must be preserved as negotiating leverage in Brussels. The government said on Thursday that talks would continue “urgently” at a technical level, following “productive” meetings involving Brexit Secretary Stephen Barclay, Attorney General Geoffrey Cox and the EU’s chief negotiator Michel Barnier. In the UK, ex-Labour MP Gavin Shuker told The Huffington Post members of the new Independent Group had first made the offer of a potential confidence and supply agreement – like the one the DUP has with the government – last month in a meeting with the PM’s second-in-command David Lidington. Then-Labour MPs Chris Leslie, Luciana Berger and Chuka Umunna, along with then-Tory Anna Soubry, who have all joined the group this week, were also at the meeting. Mr Shuker said he had told Mr Lidington he would support any type of deal provided there was a “confirmatory referendum” to get public backing but that the offer was rejected. The leaders of both main parties are battling to prevent more defections after eight Labour MPs and three Tories broke away to form a new “centrist” group in Parliament. Theresa May has written to the three Tory defectors – Anna Soubry, Heidi Allen and Sarah Wollaston – to reject what she describes as the “picture they paint of the party”, saying its record on the NHS, employment and diversity proved it was “moderate” and “open-hearted”. The prime minister offered to “continue to work together on issues” where they agree – but told the three she rejected “the parallel you draw with the way Jeremy Corbyn and the hard left have warped a once-proud Labour Party”. But she said local party branches had been warned to ensure new members support the party’s “values and objectives”. Ex-Tory MP Heidi Allen, one of the three defectors from the party, told ITV’s Peston programme “a third” of Conservative MPs were fed up with the party’s direction. Ms Greening and Mr Lee, who quit as a justice minister over Brexit, have been named by Ms Allen as potential future defectors to the Independent Group. The Right to Vote group, which is chaired by Mr Lee, said he had discussed the campaign’s calls for a pause in the Brexit process and a possible second referendum with Mrs May. Mr Lee has said one of the reasons the Tory MPs decided to quit the party was the access the Brexiteer European Research Group got to the prime minister, who he said had refused to meet his wing of the party. 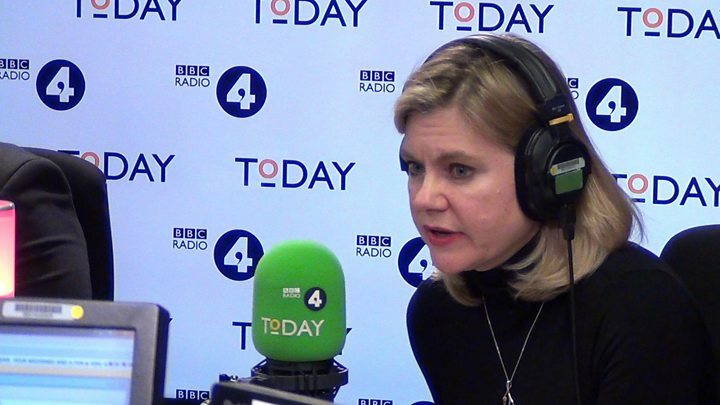 Justine Greening – a former education secretary – told the Today programme she had been tempted to break away from the Conservative Party and join the Independent Group. The Independent Group was set up by eight defecting Labour MPs unhappy with their party’s handling of Brexit and anti-Semitism. They were later joined by three pro-Remain Tories – who accuse the Conservative leadership of allowing right-wing hardliners to shape the party’s approach to Brexit and other matters. Labour’s Ian Austin also expressed sympathy with the Independent Group’s aims, saying he would think “long and hard” about his future in the Labour Party. Shadow home Secretary Diane Abbott told BBC Radio 4’s The World at One: “I am very sad that the Labour members of this new independent organisation have gone. She said she hoped they would continue to work with Labour on issues like homelessness, the benefit system, the NHS and “most of all fighting this Tory Brexit”.